Freeland fans! Welcome to another exciting review of the most electrifying show in comic book history, BLACK LIGHTNING! This week’s episode hit us with new super suits, crooked cops, factory explosions, and the best kind of movie night with the Pierces. We’ve made it all the way out here to episode 9, and somehow, someway it STILL feels we’re only warming up! As usual, I’ll do what I can to avoid telling you everything about the latest happenings in Freeland, but beware...there will definitely be spoilers ahead. The episode begins with Jefferson doing some combat training and reminiscing on what Gambi said about not being able to go back onto the streets as Black Lightning. Gambi told him that if he or Anissa go out onto the streets in costume, they will be hunted and killed by the ASA, as Gambi can no longer protect them. Before he finishes his workout, Jefferson reaches out to Inspector Henderson to confront him about how he let that Green Light tip he gave him get away (in last week’s episode). Henderson chillingly replies that he has a lot of dirty cop eyes and ears on him at the station, and he’s doing his best to help, but if he ends up dead in an alley with a bad reputation…he wanted Black Lightning to know that it’s because of the crooked officers he works with. Anissa finds a hilarious way to tell Jennifer about her newly arriving powers, but it only serves to freak her out even more, sparking a huge blow up throughout the Pierce family. As Jennifer feels betrayed by every member of the family when she discovers that she was the only one that didn’t know the family secret. She wants no parts of the superhero business, as her last foray into do-goodery paralyzed her high school sweetheart (and ended their relationship). Next, still trying to track down the five W’s of the lightning rifles used to frame Black Lightning, we see Gambi hitting the streets to do some aggressive detective work (using lethal neck injections to interrogate a past ASA member), while Jefferson and Anissa follow up on his lead with some cleverly masked good cop/bad cop action on a smarmy Freeland lawyer. With their powers combined, they gain enough information to blow the lid off ASA’s entire Green Light operation. Black Lightning and Thunder use the information to find the warehouse where the ASA has been producing and distributing Green Light, and proceed to shut down everything. They’re beating up ASA goons, destroying vats of chemicals, and arresting evil scientists! The scene ends with Black Lightning and Thunder walking away in slow motion action movie-style as the warehouse explodes. The episode ends with an adorable reconciliation between Jennifer and Jefferson around how she found out about their electrifying family secret. He reassures her that he loves her, would never purposefully hurt her, and as her father, always has her best interests at heart. The ties that bind continued to unravel for the Pierce family this week, as more and more secrets are uncovered. 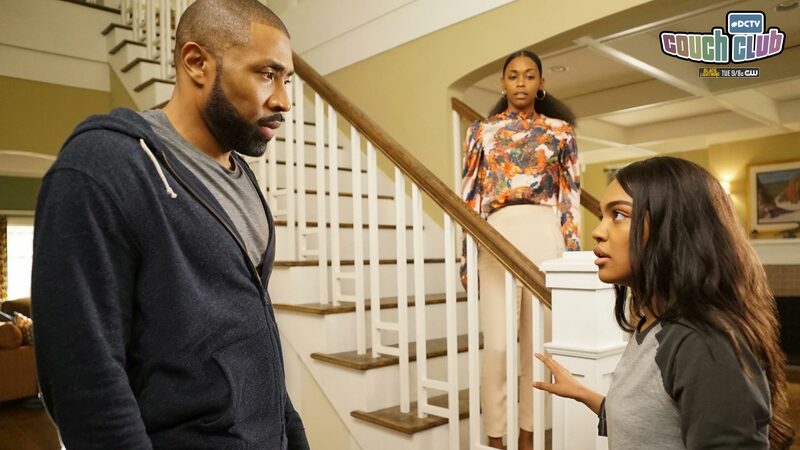 Jennifer learns that her father has been Black Lightning her entire life, and that the reason her parents divorced was mostly about the use of his abilities. Anissa learns that her “Uncle Gambi” was part of a racist government organization that’s been preying on the community of Freeland through violence, drugs, and human trafficking since before her father was born. Inspector Henderson learns that his police unit is filled with dirty cops. All that and Jefferson has decided to separate himself from Gambi, discovering how much Gambi was responsible for the death of his father and the drugs that have been funneling into the city of Freeland was more than he could bare. Lynn and Jennifer confirmed that Vixen and Supergirl are part of this universe! President Barack Obama and Congresswoman Nancy Pelosi cameos for the win! Well, that’s all we have for this week’s Black Lightning! Let me know how you felt about it in the comments below and I’ll try to get a response your way sometime later this week. Or, if you really can’t wait to get some Black Lightning stuff off of your chest, you can hit me up anytime on Twitter at @RegularEtCetera. Peace! Krypton: Who is Adam Strange?